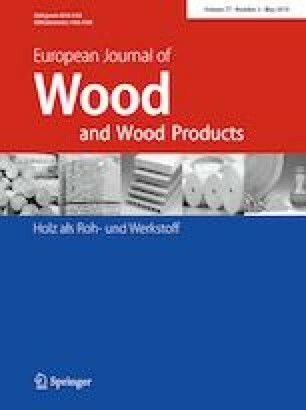 The first objective of this work was to study the influence of veneer quality on the mechanical properties of laminated veneer lumber (LVL) made of secondary quality hardwood. The second objective was to propose an adapted veneer thickness that provides the optimum mechanical properties of LVL, taking the veneer properties into account. Forty-eight LVL panels glued together using polyvinyl acetate (PVAc) were prepared. The quality of fresh veneers was assessed by measuring veneer knot proportion, lathe check depth and lathe check interval. The static modulus of elasticity (MOE), dynamic MOE, modulus of rupture (MOR) and shear modulus were measured using destructive and non-destructive methods. The 3 mm thick veneer provided the optimum mechanical properties for LVL for both species. The test direction did not have any significant influence on the mechanical properties. In the flatwise direction, the average MOE values obtained were 13.2 GPa for beech LVL and 13.3 GPa for oak LVL, whereas the MOR was 72.0 MPa and 63.4 MPa, respectively. Increasing knot proportion in veneers results in a decrease in LVL MOE and MOR. Moreover, deeper lathe checks and higher lathe check intervals on veneer surfaces provide lower LVL shear modulus in the edgewise direction for both species. Internal veneer provides LVL with a higher density but weaker mechanical properties due to a higher knot proportion in the internal veneer. The authors are grateful for the financial support of GDR 3544 Science du Bois and the Indonesia Endowment Fund for Education. We also wish to thank our partners and funders of the Xylomat Technical Platform from the Xylomat Scientific Network funded by the ANR-10-EQPX-16 XYLOFOREST project and the Bourgogne Franche Comté Region.